Each year at its Annual General Meeting, Alberta TrailNet awards the provincial “Trail Blazer Award” to an individual who has made significant contributions to, and demonstrated long-standing commitment and involvement in, trail planning and development in Alberta. In selecting the recipient, Alberta TrailNet recognizes that this person’s accomplishments are often supported and reflected by the contributions, commitment, and achievements of other trail builders and supporters within that community. The Trail Blazer Award, created by sculptor Rick Silas, is a beautiful, hand-carved, large wooden boot on a tree stump that features the names of the award winners engraved on brass plates. 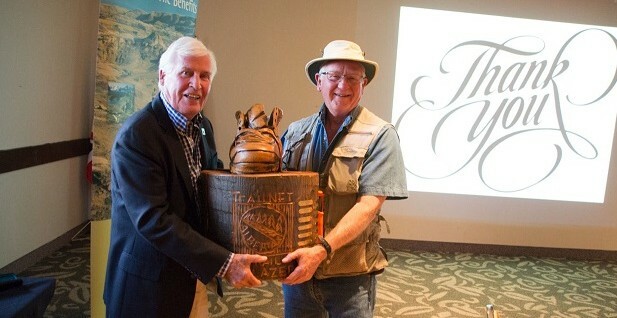 Each award recipient receives a smaller hand-carved wooden replica of the Trail Blazer Award made by sculptor Ilb Rasmussen. New in 2018, this award is presented for significant contribution of time and effort to improve and achieve ATN mission and objectives especially on specific trails. 2018 Winner is Danny Smyl – Alberta’s Iron Horse Trail and other local and regional trails in his area. 2010 – The Provincial Trail Map Project, a key TrailNet initiative, received American Trail’s National Trails Award for Trails Advocacy in November, 2010. TrailNet Executive Director Linda Strong-Watson accepts the award from the American Trails president. 2008 – Alberta Tourism Awards. The Northeast Alberta Trails Map Project won Travel Alberta’s “Friends of Tourism” Alberta Tourism Award (ALTO). The award recognizes an organization that, through its activities, has made a significant contribution to the provincial tourism industry. Alberta Premier Ed Stelmach (centre), Alberta Tourism, Parks and Recreation Minister Cindy Ady (right) and Alberta Infrastructure Minister Ray Danyluk (left) recognize the Provincial Trail Map Project in 2010.